How many breakfasts do you want? Daryl, Denise and I were in the restaurant, and had already started our buffet breakfast, which was included with our voucher, and wondering where Dutchy was. He finally arrived, instructing us to get up and get out of there, as we were in the wrong restaurant! It was still the same hotel, so I don’t think it was any great drama. I finished off my first course, or pre-breakfast as it were, then we went up to the 33rd floor where obviously the view was more spectacular than on the first floor, as you could see both the US and Canadian Niagara Falls, but the wait was longer. The welcoming committee was not very welcoming. The woman who greeted us, or rather, ordered us to stay at the top of the stairs until we were summoned, had the most sour face we had seen in a long time. What on earth was she doing in the hospitality industry? 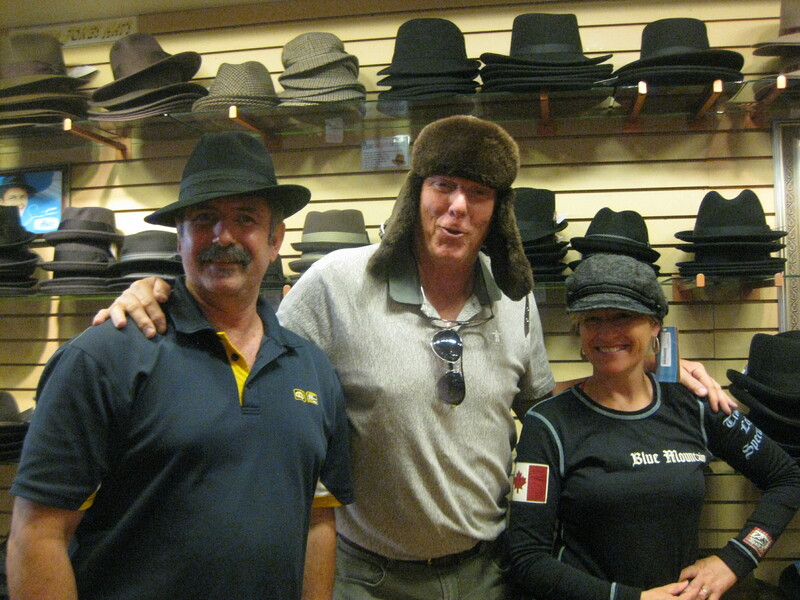 After we had checked out, we drove to Niagara-on-the-lake to do a spot of shopping at Beau Chapeau. Dutchy had always wanted a Stetson, and I said that if he really wanted it, he should have it, even with a price tag of $200, plus tax, and please note that I didn’t make a fuss about it at all, despite his carry-on about my designer shirt. Admittedly, a good hat like that should last almost forever, unlike an article of clothing. I ended up buying a cap there too, so it was hats on all round. The hat box we decided could be added to hand luggage, and if desperate, we could wear the hats on the plane. 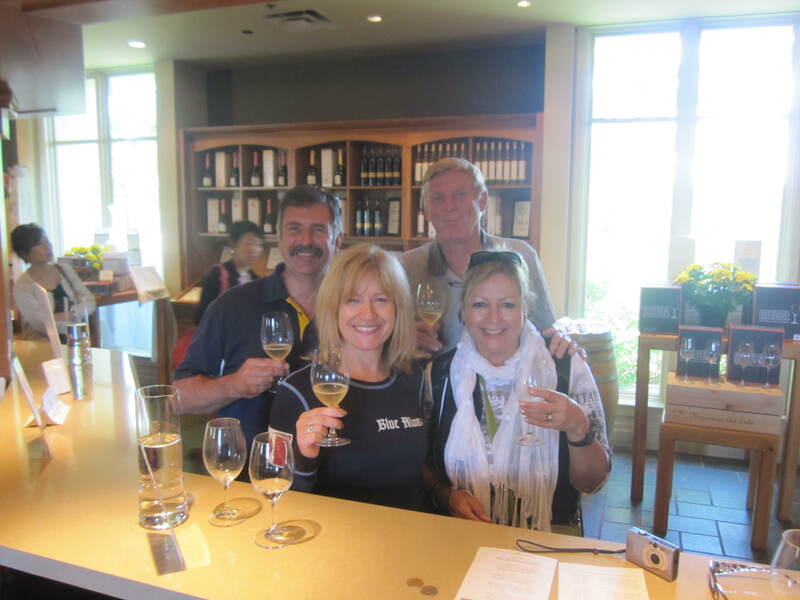 An enjoyable hour or so was spent at Peller Estates Winery, where we enjoyed a tasting experience as well. We learned how you hold the glass by the stem, swill it around a little to breathe, smell it, and take a sip. Swish that around your mouth a little, to clear the palate, then twice more so you can really taste the wine. That’s Sandi Wine Tasting 101. We tasted a red, a sparkling and then we tried something different. Ice Wine is a very sweet aperitif that is very expensive, but when you hear how the grapes are picked and the precise temperatures they have to be you understand why it is pricey. It is generally served after dinner and is sold in 375 ml bottles only, at about $95 each. The fear of excess baggage was a good excuse not to purchase any. It was a long drive back to Kimberley, and when we returned it was time for the hot tub. I didn’t stay in there long as it was too cool for me, so I actually did something in the kitchen, getting instructions from the balcony as to what to chop and prepare next, which went towards our nice dinner of veal and pasta. Karaoke after dinner concluded a lovely stay with our new friends. The idea had been to see some of Toronto before we left, but we had had enough of driving, so we opted to spend that last morning relaxing, as it would be our last taste of home-life before hotels and the cruise. As it was, the drive to the airport took two hours. Apparently airfares from Toronto can be more expensive than from Buffalo, and since both airports are about the same distance away, it’s a factor to consider for any further visits there. Another saving can be made by choosing Tim Horton’s over Starbuck’s, which we tried at the airport. What a difference in price, and for equivalent quality. Flying Air Canada there was no food provided, only one juice, and you had to pay for headsets. Fortunately we had our own, and I enjoyed The King’s Speech. I also opted for the French language instructions to continue my bi-lingual skills, which of course start slipping when not in use. From there it was back to the USA for the international travellers, ready for the next leg. This entry was posted in Canada, travelswithprincessandquiquinou and tagged Beau Chapeau, Ice Wine, Peller Wines, Stetson. Bookmark the permalink.